Yes, #SuperThursday – it’s a thing… Apparently, today the market will be flooded with new books. No doubt many of those books will have the might of the publishing industry behind them. They will have glossy covers and a big marketing budget so you will see the book or the author everywhere for a few weeks as they promote their book. I’m self-published so I rely on kind friends and family (and they were very kind and generous indeed) and promoting myself via the medium of social media. Anyway, as it is #SuperThursday, here is a little plug on behalf of independent artists… You can buy all of the above books via the Comely Bank Publishing website, and through Amazon, Kobo and Smashwords. 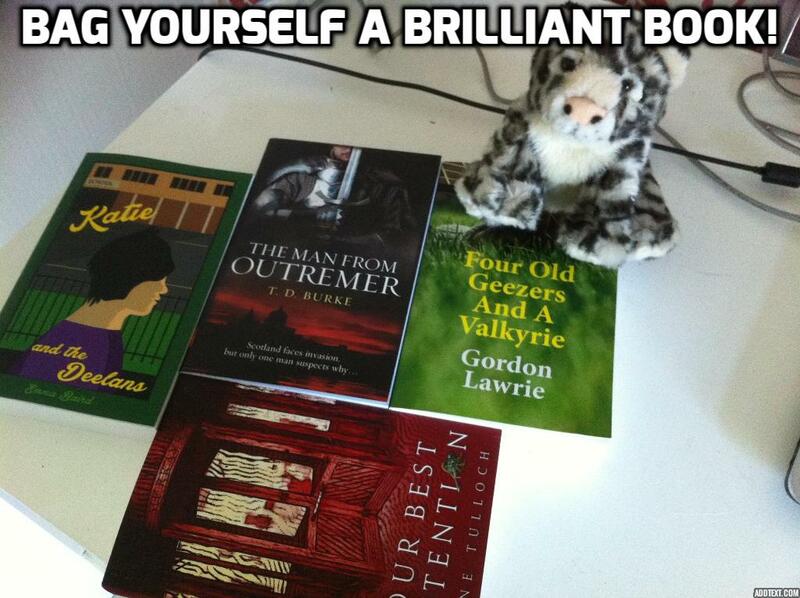 Four Old Geezers and a Valkyrie by Gordon Lawrie is an entertaining romp set in Edinburgh. Brian, aka ‘Captain’ is a reiteed teacher who has split acrimoniously from his wife. A chance meeting with his best man encourages Captain to dig out his 40-year-old guitar and leads to a series of hilarious jam sessions in a back garden in Merchiston during which they record a couple ofptain’s own songs. Posting these on YouTube, they prove to be surprise hits, sending the four ‘musicians’ and their lawyer into a series of encounters with a tiny manager, a boy-band and a female Polish dancer, a cigar-puffing earl and a famous rock band. The Man from Outremer by T.D. Burke is a swashbuckling tale of treachery and action. Set largely in Scotland at the time of the early Scottish Wars of Independence around 1300 AD, it follows Derwent, a Scottish Crusader-turned-clergyman, and his involvement first of all in the Fall of Acre in Palestine, then later as Prior of Roslin in Scotland. Against Derwent stands his nemesis, an English spymaster who is desperate to conceal a dark secret from the Crusader days. In time, they will confront each other in battle at Roslin. Katie and the Deelans by Emma Baird is the story of Katie Harper and her friends, ordinary teenagers who go to the worst school in the country. Life, however, takes a turn for the extraordinary when Katie and her friends take up magic lessons. Our Best Attention by Jane Tulloch will be published in January 2016. Set in Murrays, a fictional Edinburgh department store in the 1970s, OBA tells the story of the store’s attempts to adjust itself to modern times through its various staff members and customers.